Here at Pierate we love a good, pun-heavy and banterous article title, even if it does come at the expense of actual accuracy for the pie it relates to. And this is no different, for I am not in any way promoting the eating of a Leak filled pie, or even a pie with any Leak in, but instead bigging up the very delicious Chicken and Bacon pie I had a while ago at my good friend Mr Leak’s house. It was a well crafted pie packed with Chicken and Bacon goodness, harking back to the good old days of meatilicious meals when we lived together. 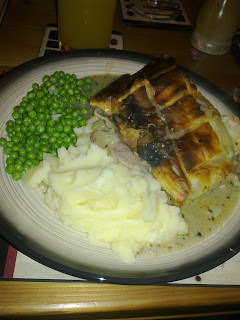 As the photo highlights, the pastry was a little crisper in some place than others, but the meat feast inside the pie well and truly made up for it. The chicken and bacon was succulent and was filled to capacity. The gravy was very nice too. A lovely homemade treat!